Experienced DSC Trainer, Mike Phillips, outlines the importance of delivering the right kind of training and gives us a sneak peak of his ''Train the Trainer' course he delivers at DSC. Having delivered training for over 20 years, that’s why I’m so passionate about it: we can really influence others and have an impact on our charities; the results we achieve and the beneficiaries we serve. The research demonstrates that creating interactive training sessions that appeal to the four preferred learning styles – helps us ensure that learning has an impact on those that attend our courses and workshops. 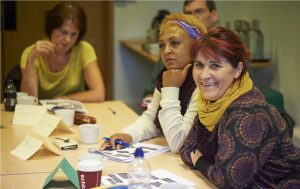 So, if your job role involves training others, I hope you can attend the Train the Trainer course at DSC – come and find out the theory of learning and training and how it influences the training we deliver. You’ll leave with a toolbox of activities that you can adapt and use within your own workplace – and I can promise you’ll have fun in the process – adults learn best when training is fun, interactive, practical and can be transferred to their real-life experience. During the course, you will learn about the training cycle and how to go about preparing, delivering and evaluating your training courses/workshops. We’ll also explore how to handle group dynamics during a training session and you’ll have the chance to deliver a short 10-minute training session of your own. With this two-day course, there’s also the option to complete a short assignment (all the information required is covered during the actual course) and receive an Institute of Leadership and Management (ILM) endorsement. Even if you decide not to follow the ILM option, I can guarantee that you’ll go away from the Train the Trainer course with increased confidence and lots of ideas for your future training sessions. Not only will you take away a treasure-trove of ideas – you’ll also be able to pass on your knowledge and expertise to your own course participants so that their learning becomes a treasure too.